It was the start of my older son’s college career this weekend. My wife and I drove south to move my son in at Trinity University in San Antonio. We went down Friday for a multi-day event, and came back late last night. The move-in was organized and all went well. My son’s roommate is from the Chicago area and the two other suite mates, on the other side of a shared bathroom, are from Dallas and The Netherlands. We attended multiple lectures, which was orientation for the students, but equally for the parents, no doubt, to put them at ease as they part company with their kids. During our two-day stay, we did a run to Target and Costco to pickup some extras, and my wife and I stayed Friday night in a nice hotel, downtown on the Riverwalk. About the only slip-up was on my part. A relatively minor one where I forgot to bring an extra battery and charger for my Olympus. I shot a fair number of photos, but had to ration my battery power, so I didn’t take as many photos of downtown that I hoped. I certainly had to make sure that I had enough power for the important school activities. 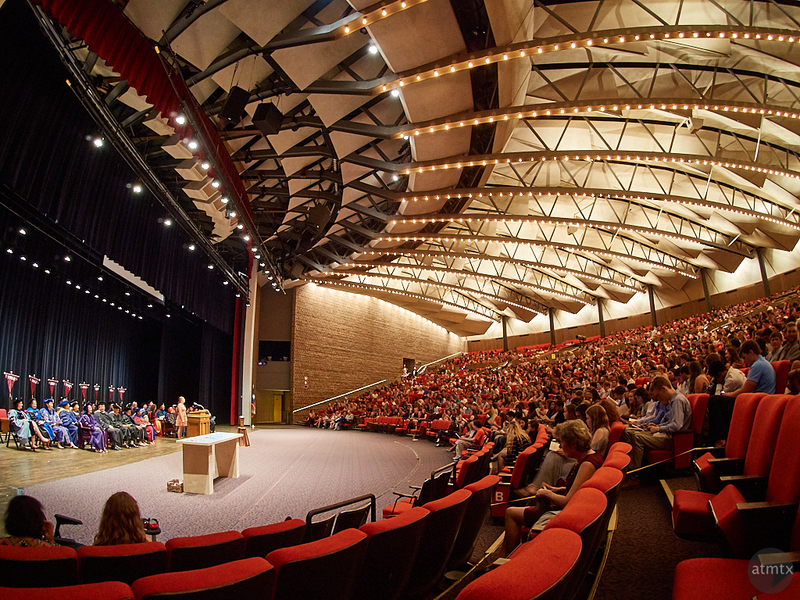 The last major event was the Convocation, held at the Laurie Auditorium, on campus. It was nice that the parents got to attend the pomp and ceremony of the class introduction and the students’ signing of the honor code. The 2,700 seat auditorium is impressive for a small university with a population of 2,300 students. As usual, I analyzed the options and sat in the best place for photography. Right next to, it happens, a gentlemen with a Leica with 90mm lens. I used my Olympus with my 12-40mm which worked well. I also quickly switched to the 9mm fisheye bodycap lens, which I used to make this sweeping view.